Okay, let's just get it out of the way: it's f'ing cold outside. This polar vortex, or whatever they're calling it, is making me one miserable lady. Traveling to an 8 a.m. meeting downtown yesterday morning when it was 5 degrees outside (and feeling more like negative 50 to me with the wind) was pretty much the worst idea anyone has ever had. When it's this cold, we should all be bundled up inside with a hot cup of coffee, layers of blankets, and a fire. Life outside of the front door should be canceled for the day. Do you guys agree? Maybe we should protest? I know. I'm kind of a baby. It's even colder in other parts of the country, and I should be grateful that I have a warm coat and a job and a heated home. I just need to keep repeating that. 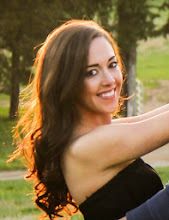 And also reminding myself that I WILL live somewhere warmer one day. Cold winters are simply not for me. You know what does make me feel pretty warm and happy and grateful though, even in such unforgivable weather? This pasta bake. 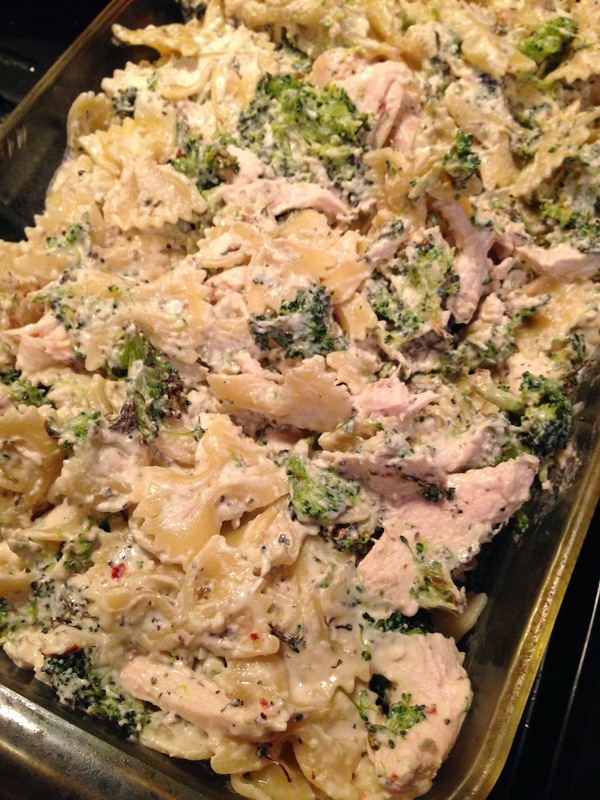 Filled with chicken, oven-roasted broccoli, herbs, and cheese. Topped with fresh mozzarella slices and baked to warm, melt-y perfection. I made it this past weekend and fell in love with every bite... so much so that I was tempted to gobble up the whole thing in one sitting (with Ryan's help, of course). I'm so thankful that, instead, we enjoyed two hearty portions then froze the rest to have for dinner again tonight. I get to enjoy this baby again! In less than 12 hours! Knowing that, I can brave the bitter outside world today. Yes, roasting the broccoli before adding it to the casserole is an extra step, but it's totally worth it. And easy. So do it! It adds that nice roast-y flavor to the bake and takes it to another level. And the fresh mozzarella slices on top? Perfection. 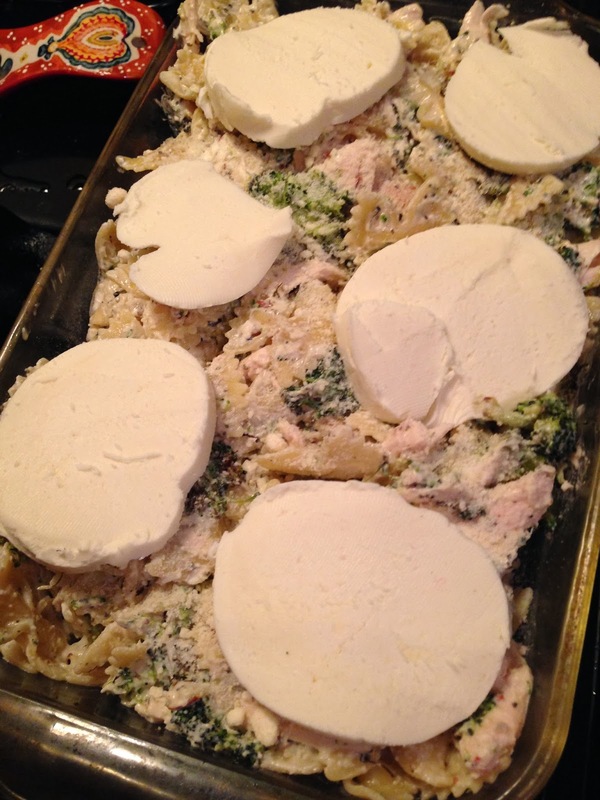 Yes, you could use shredded mozzarella if it's what you have, but promise me you'll try it with fresh sometime! Cause it's awesome. I didn't calculate calories or fat for this dish or anything, but it's definitely healthier than it tastes. There's no butter, and greek yogurt replaces more than half of the cream cheese to keep it light but still creamy. By using just a small amount of parmesan IN the dish and single slices of mozzarella on top, we cut down on the amount of cheese while still keeping each serving tasting super decadent. Use whole wheat or fiber-enriched pasta and you have a nutritious dinner filled with protein, healthy carbs and fats, and veggies. Win! Chop about 12 ounces of broccoli into bite-sized florets. Place on a foil-lined baking pan and drizzle with 2 to 3 tbsp olive oil. Toss to mix, then spread out on pan. Sprinkle with sea salt and pepper. 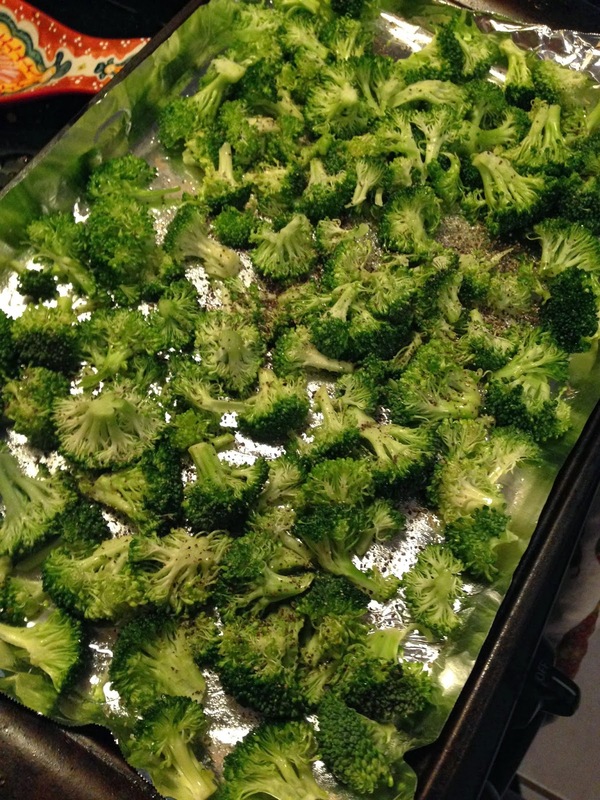 Roast broccoli for about 20 minutes at 375, or until the broccoli is starting to brown. Meanwhile, cook pasta according to package directions. Cook about 2 minutes less than you normally would, so that it is still extra al dente, because it will continue to cook in the oven. Drain. 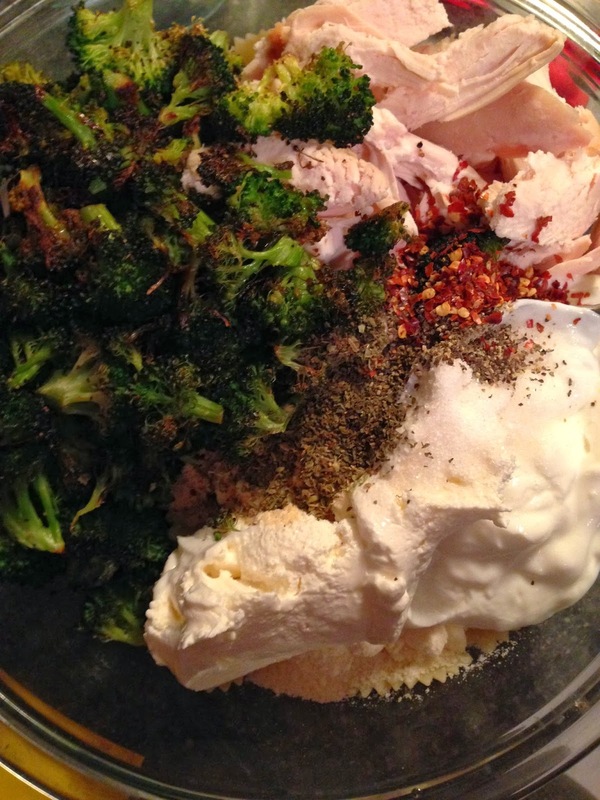 Then, in a large bowl, mix the cooked pasta, roasted broccoli, parmesan cheese, greek yogurt, cream cheese, milk, and spices. Mix well until it's all incorporated and the ingredients and distributed evenly. Spray a casserole dish with cooking spray. Pour the pasta mixture into the dish evenly. Top with the 6 slices of mozzarella. Bake uncovered at 375 for about 30 minutes, or until cheese is melted and it's starting to brown slightly. -Line a baking sheet with foil. Lay broccoli down in a heap and pour 2 to 3 tbsp olive oil on top. Mix well, then spread out across the baking pan (be sure not to overcrowd). Sprinkle with sea salt and pepper. Roast for 20 minutes, or until the broccoli is starting to brown. Remove from oven. -Meanwhile, cook pasta according to package directions. Cook about 2 minutes less than you normally would, so that it is still extra al dente, because it will continue to cook in the oven. Drain. 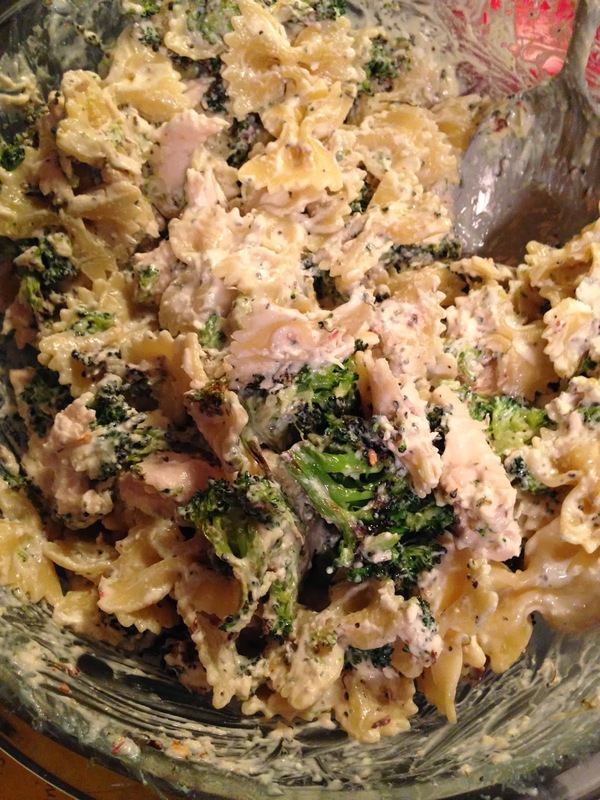 -In a large bowl, mix the cooked pasta, roasted broccoli, parmesan cheese, greek yogurt, cream cheese, milk, and spices. Mix well until it's all incorporated and the ingredients and distributed evenly. -Spray a casserole dish with cooking spray. Pour the pasta mixture into the dish evenly. Top with the 6 slices of mozzarella. -Bake uncovered at 375 for about 30 minutes. yes yes yes and yes - can't wait to make this one - it's happening REALLY soon because it looks so delicious!! oh my gosh this looks amazing!! can't wait to try it out! Is there anything more comforting than pasta bakes?? Nope! I'm a total baby too. My winters are numbered before I move west! Can't take this weather at all. Oh goodness gracious, this looks creamy and fantastic! Love this, and that melty cheese on top looks absolutely scrumptious. Seriously - is anything better than melted cheese? !